Iowa supplied the turkey for the White House Thanksgiving celebration last year and that was one of the bright spots in what has been a tough time for producers. Gretta Irwin, a spokesperson with the Iowa Turkey Federation in Ames, says turkey growers have faced some of the same problems as other livestock producers. Irwin says the higher corn prices did have a ripple affect on the industry and forced some of the west coast processing plants to shut down. She says the shutdowns helped ease some of the strain on the number of turkeys raised and help the industry adjust. While there’s been the closing of some plants outside the state, Irwin says those in the state continue to maintain and develop in Iowa. She says companies like Sarah Lee Foods and West Liberty have continued to invest in Iowa producers and raising turkeys here. Irwin says the investment has been good for rural communities as each turkey raised adds close to $22 in economic activity for a community. Irwin says Iowa producers have had to deal with economic adjustments. Irwin says producers are getting a fair price, but the have had to cut back on production with the downturn in the economy and a lessening of demand as people don’t eat out as much. Irwin says the turkey industry in the state is diversified and doesn’t produce the whole birds that are on the Thanksgiving table. Irwin says Iowa raises turkeys all year long and they end up being part of meals that you would buy at a Subway, Jimmie John’s sub sandwiches or lunch meat in supermarkets. She says the turkeys raised in Iowa are “all year long products.” Iowa raises about 8-million turkeys a year, which ranks 9th in U.S. turkey production. 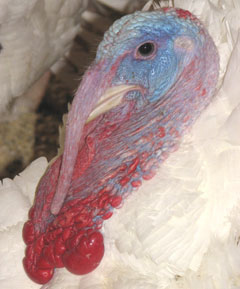 Irwin says the state processes more turkeys than it raises and ranks fifth in turkey processing.